I was a late bloomer in many persuasions of personal style and fashion (I didn’t start wearing make-up until I was about 25) and my love of shoes was a similar slow-burner. In college my shoe collection consisted of a few different pairs of skate shoes – actually, a few different pairs of the same skate shoes – Etnies – just with different coloured ‘E’s’ on the side that I’d match to the colour of my hoody (hey, it was 2001). 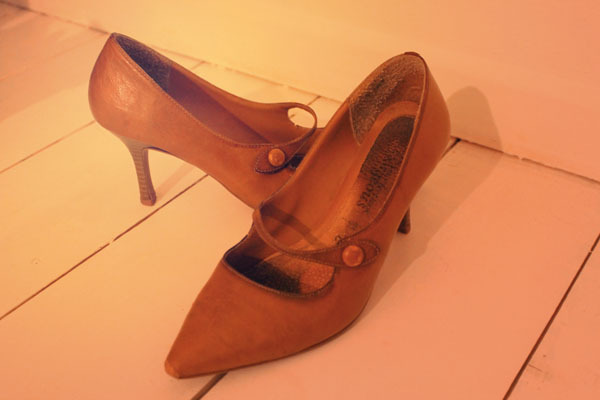 I remember buying my first pair of heels when I was about 23 or 24. I was going out with a group of old school friends I hadn’t seen for many years and I wanted to exude confidence and style. I bought a pair of pointed court shoes from New Look and tottered around Chicago Rock in Fareham in them (most likely instead exuding awkwardness and discomfort). My feet killed by the end of the night (the heel was a skyscraping 2″ high) – my toes felt crushed, the balls of my feet burned with the burden of a high arch. I felt part of an exclusive elite of women who suffer for fashion. I was sold. the very same shoes – marvel at their height! (Drunk on the glee of being a newly inducted heel-wearer I then decided to wear the same shoes to work on the following Monday, forgetting that my walk to work involved a steep downward slope. I adopted a penguin walk that involved a slow shuffle and a shameful look down at the pavement whilst everyone overtook me. I have since learned to walk in heels but have still not quite mastered walking down steep hills in them). Since then my shoe collection has grown exponentially. 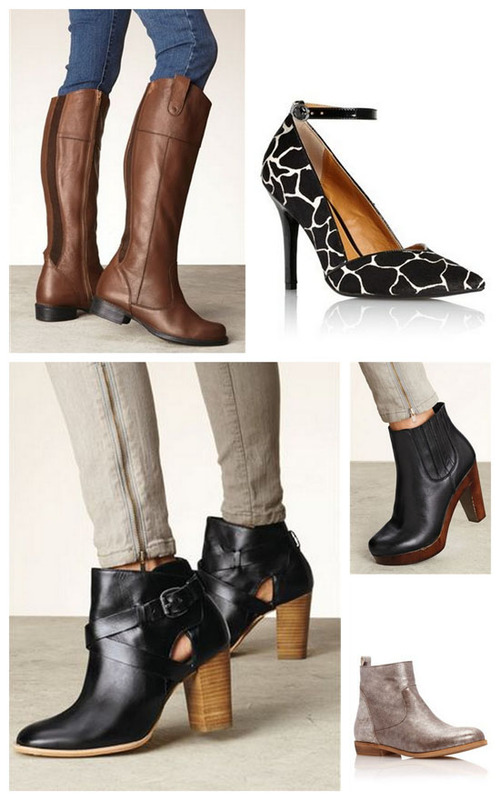 I greatly enjoy the androgynous brogue, the simple ballet flat, the clunky platform heel and the stompy Chelsea boot. My shoes enjoy multiple storage locations throughout our house – they slide into shelves in my wardrobe, are stacked in a downstairs cupboard and (to my boyfriend’s frustration), find themselves under sofas, by the front door, on the bedroom floor… (one once ended up in the freezer, but that’s another story). But the point of this post was to answer a question set in the lovely Laura from Daisy Chain Dream’s Next competition – ‘What is my favourite pair of shoes?’ Oh the agony, the unfairness of it! How would I choose a favourite from my collection of covetable clodhoppers? 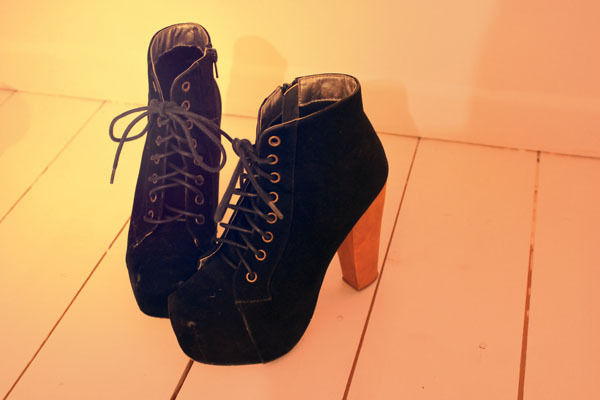 I decided eventually on my faux-suede platform boots (don’t listen shoes, I love you all equally really!) Bought about a year ago their selling point for me is their versatility – even though they ‘look’ high, the concealed platform means they’re surprisingly easy to walk in and they are taken on many outings – dinners out, nights out, trips to town and so on. Trite as it sounds, after being a teeny person all my life, I like the way they make me feel. Whenever I know I have a day at work when I need to feel confident and sure of myself, out come the boots. Best of all, they always induce those six words we all love to hear, “How can you walk in them?” After years of quite literally being ‘looked down on’ at work it’s sometimes really confidence boosting to slip on a pair of heels and be nose-to-nose with your peers. Their children’s section aside, they also have some great shoes in their big person’s section. I’ve picked out my favourites from their current collection. (Those cutout ankle boots must be mine). Are you a shoe lover? Do you have a favourite pair? You can enter Laura’s Next Shoe giftcard giveaway here.